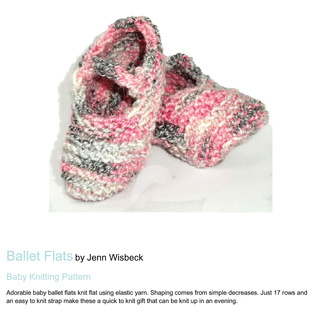 Adorable ballet flats knit flat using elastic yarn. Shaping comes from simple decreases. Level: Intermediate - You need to know how to increase, and decrease. Size: Newborn and up. Finished length is 2.5 inches, if you use a stretchy yarn the slippers will stretch to 3 inches long. Notes: Maizy or Panda Cotton would be good yarns subs. 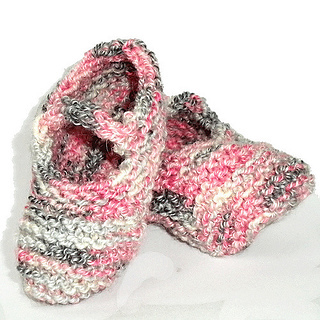 You could use a non stretchy yarn, but the stretch helps keep the booties on and gives a greater range of sizes.